[toc]With increasing cases of gout, there are a number of gout remedies which have come into practice these days. However, before understanding the remedies for gout first we should look into the reasons which cause them, since it is important that the problem needs to be uprooted from the basics. Acute swelling of the knees, toes, finger joints, etc. are some of the most common symptoms seen here. Charcoal poultice is another natural cure for gout. 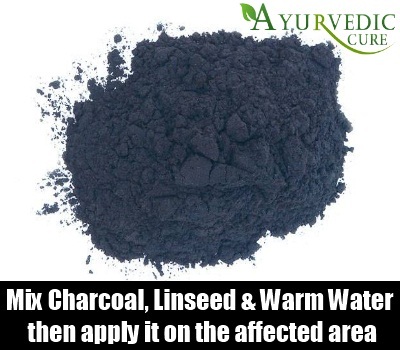 To prepare this charcoal poultice, you have to mix one half cup of activated powdered charcoal and few tablespoons of grounded linseed together in a blender. Wait until it becomes a meal and then add enough amount of warm water for creating a paste. You have to put this paste on your affected joints and cover them with plastic or cloth. You have to change the dressing every four hours in a day or can leave it overnight. Firstly cherries seem to be a good remedy, whether it is sweet or sour. 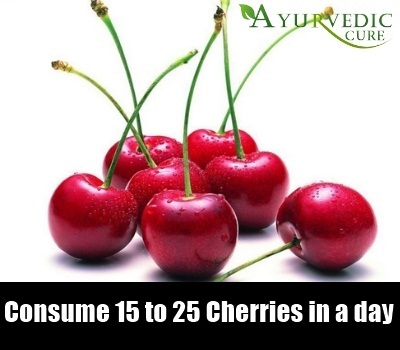 The patient should normally consume 15 to 25 cherries in a single day. After few days, they can reduce it to ten cherries a day as well. The most advisable thing would be consumption of fresh cherries. However, in case of non availability one can have canned cherries as well. In this case one needs to increase the intake of foods which will neutralize and combat the uric acid which has increased tremendously in one’s body. So add more cherries to your diet. Secondly, vegetable juices are a highly recommended remedy for gout. 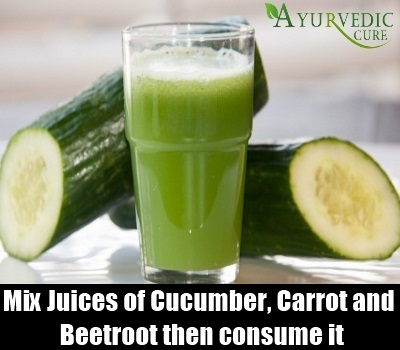 The most valuable advice in this regard is a mixture of carrot juice with cucumber and beetroot. For instance one can combine 300 ml of carrot juice with 100 ml each of cucumber and beetroot juice would be a perfect combination. These juices need to be taken everyday. Thirdly, French beans juice or string beans is an excellent option remedy of gout as well. 150 ml of the juice from French beans need to be taken diligently everyday for curing gout. This has been the natural treatment for many diseases. Curing gout via the modes of natural remedies has been an ancient practice. 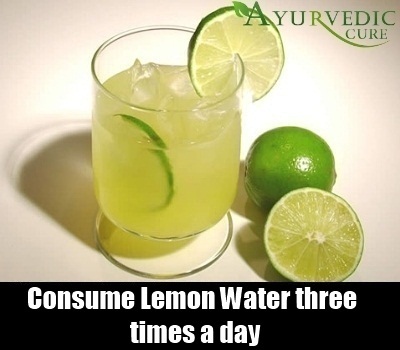 The most common and effective treatment here would be consumption of lemon water three times a day. It works because lemon is rich in vitamin C and helps to dissolve all the gouty particles found in the body. The juice of half a cup of French Beans, twice a day is also a natural gout treatment. You can follow a modified purine diet by eliminating food like liver, kidneys, brains and other meat organs and sweetbreads. You can take 100 gms of protein foods per day to cure your gout. Another natural gout remedy is changing the intake of amount of water. 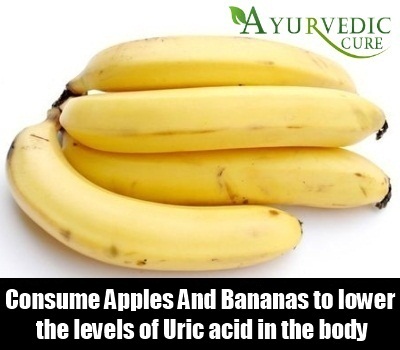 This can help you to flush out the excess uric acid in preventing kidney stones. The remedies for gout that come from the kitchen include the consumption of citrus fruits. These are rich in vitamin C and cure gout. Consumption of 3-4 Bananas a day is suggested as the fruit is rich in phosphorous and lowers levels of Uric acid in the body. Apples too are rich in nutrients and this would help you to heal the problem faster. Apple can be taken in the form of juice also. Another natural and safe treatment for gout would be using the help of water. Fill in your bathtub with water along with some crushed ginger. Allow yourself to soak the toes or even your complete body in the water. This can be done twice a day to get relief from pain and inflammation. Apart from the benefits listed here taking a bath in ginger water also refreshes the mind and body. Apart from this, you should also remember that drinking more of water will help you to flush out toxins. 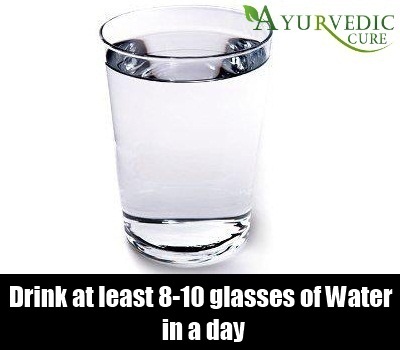 So try to aim for at least 8-10 glasses of water a day. It has been seen that baking soda, which is commonly known as bicarbonate of soda really helps to heal the problem of gout, along with swelling. Basically you need to mix a spoon of the baking soda in a glass of water. Then mix it well using a spoon. Once it has been dissolved properly drink the same. Remember that this mixture should be consumed at least 3-4 times a day. It is advised that you drink at least one glass from this remedy before going to bed. The treatment will not get you instant results, but with a little patience, you will see results in a few days. It has been seen that improvement of blood circulation helps to treat gout. You can do simple exercises like walking or swimming. What happens here is that the muscles, which get tensed because of the gout are more relaxed and this helps in faster healing. You can also do yoga and stretching exercises. Some of these include forward bending or paschimottasana, sudapta asana or standing tall with the balance of the body weight on the toes. Flexing the toes and problem areas, while keeping regular movements helps too. Massage and other physio therapy treatments are always beneficial for problems like gout. Make sure that you take suggestion from an expert before proceeding. Else, the problem may get aggravated, if the wrong nerves are triggered off. With these simple and natural remedies, you can get rid of gout in no time. But do remember that you have to be a little patient for this!